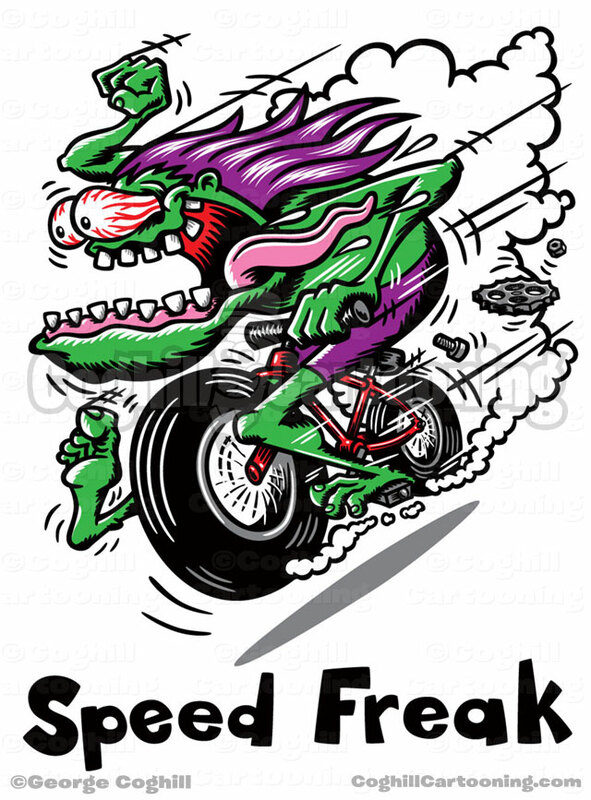 This lowbrow-style cartoon monster on a fat tire bicycle was created for a bicycle accessory reseller and retailer looking to expand their product lines, particularly their humorous t-shirts. With the surging popularity of fat tire cycling, the client wanted to capitalize on the trend. The project instructions were to have a cartoon “lowbrow” style monster on a fat tire bicycle racing down an incline. 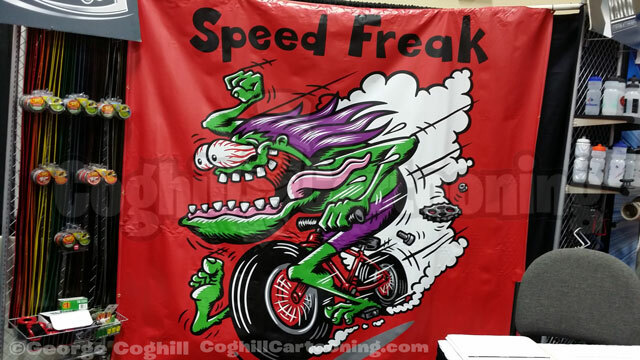 I liked the idea of a play on words for the text (“Fat Chance”) as you can see in the initial sketch below, but the client preferred the phrase “Speed Freak”, inspired by my lowbrow hot rod cartoon monster art. As you can see from the sketch progression above, the final art remained nearly exact to the initial sketch. The major change was to add the smoke cloud trailing our hero. The edit between the second and third sketch above were the addition of black line shading and white line highlights to the creature. Because this art was going to be screen printed on t-shirts and other items with a similar printing process, from the start I created this design with a limited palette in mind.